Japan's Venus Climate Orbiter "Akatsuki" was designed to study both the atmosphere and surface of Venus. SAN FRANCISCO — After blowing its first chance to orbit Venus two years ago, Japan's Akatsuki spacecraft is ready for a comeback in 2015, mission scientists say. The Akatsuki probe — whose name means "Dawn" in Japanese — was supposed to start circling Venus in December 2010, but its main engine conked out during a pivotal orbit-insertion burn, and the probe went sailing off into space. While Akatsuki's main engine has been declared dead, the spacecraft should be able to achieve Venus orbit in November 2015 using its smaller attitude-control thrusters, team members say. The hopes of mission scientists were buoyed in November last year, when these smaller engines performed a burn that set up the 2015 maneuver. "We had never used these thrusters in this way," Takeshi Imamura of the Japan Aerospace Exploration Agency, or JAXA, told SPACE.com here earlier this month at the annual fall meeting of the American Geophysical Union. "Now we are confident we can conduct an orbital-insertion maneuver using these thrusters." Akatsuki has some other issues to contend with, however. After missing Venus two years ago, it settled into a solar orbit that brings it closer to our star than mission managers had anticipated. As a result, the probe's temperature has been inching up more and more on its recent closest passes of the sun. The mission team thinks those increases may be starting to level off. If that's the case, Akatsuki should survive the half-dozen close solar approaches it will make before November 2015, Imamura said. The $300 million Akatsuki spacecraft launched in May 2010 along with JAXA's Ikaros solar sail, which successfully deployed in deep space. Akatsuki was supposed to spend two years eyeing Venus from above, studying its clouds, atmosphere and weather for clues about how Earth's so-called "sister planet" ended up so hot and seemingly inhospitable to life. Akatsuki was originally slated to fly around Venus once every 30 hours. If the November 2015 maneuver succeeds, it will instead settle into a much more elliptical one-week orbit. The probe could still do good science from such a long, looping path, Imamura said. "We hope to still be able to do most of what we originally planned," he said. Akatsuki was the second unmanned Japanese probe ever sent to visit another planet. 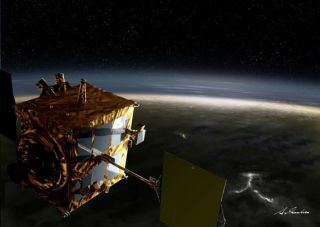 The first was the Nozomi Mars orbiter, which failed to enter Mars orbit in 2003.